With the recent tragedy that struck Japan and the inane incidents that followed in Malaysia, the people over at the Mandarin Comic Society, Comic Fiesta and The One Academy came up with a very quick and brilliant idea to raise funds to help the victims of this natural disaster: Projek Harapan. 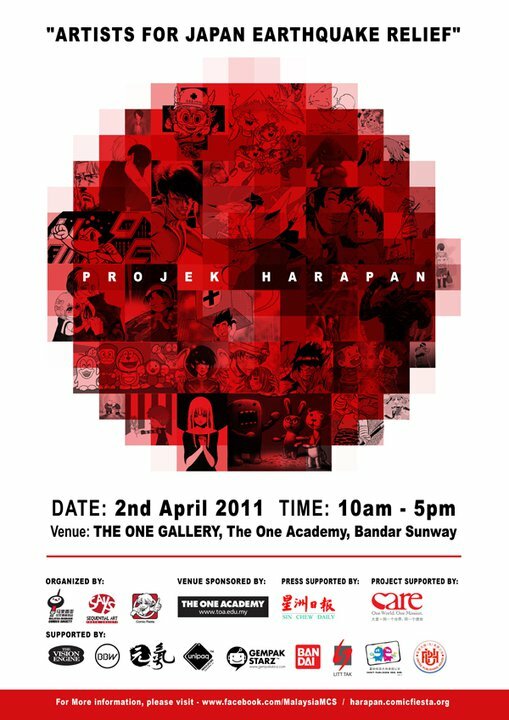 The project, set up about a week after the earthquake struck, was a rallying call to Malaysian artists to contribute artworks that would be ultimately displayed at an exhibition at The One Academy’s Gallery as well as get compiled into an artbook aimed to raise funds for Japan. The deadline for submission has already passed but you can view all the submissions that made it in time in the photo albums on Comic Fiesta’s Facebook page. Despite the deadline being really close to the date of announcement, the response was overwhelming; submissions kept pouring in after the deadline in the form of comments with links to art on Comic Fiesta’s Facebook Wall even after the initial 300+ received (and mine’s in there somewhere as well *coughcough*). I got the insider’s scoop that the amount of submissions baffled even the organizers, who initially only expected a humble total of about 50 submissions at most. As such, they are now forced to select only the outstanding submissions from the pile to be included into the final artbook, which will be sold at the Projek Harapan Exhibition which will be held on the 2nd of April 2011 from 10am to 5pm at The One Gallery, The One Academy of Communication Design, 28 Jalan PJS 11/28A. All donations and proceeds from the sale of the artbooks will go directly to the Japan Fund unless stated otherwise. Some established local artists like Lefty, C2V, and Tan Eng Huat have also contributed to the project, so if you’re a fan of theirs you should grab a copy to add to your collection of their works! This project may seem trivial and self-serving at first, but I think it’s a great outlet for those who can’t afford significant donations to contribute to a deserving cause. So if you have the time to spare on Saturday this weekend, do hop on down to The One Gallery to show your support! For more information (like the list of activities being held) or enquiries, you can visit the Projek Harapan Facebook Page. After a long while of silence (e.g. : new job in a new country), I finally mustered up the drive to start posting again. A good thing too since this piece of news is pretty exciting to me! Galeri Chandan, located at 15 Jalan Gelenggang, Damansara Heights, will be home to a comic art exhibition aptly named ‘Sequential Narratives’ that will take place between 19th February to 18th March 2011. I got wind of this exhibition through Facebook, and my curiosity was piqued by the teaser photos posted. All I can say is this: Even though it’s about comics, don’t expect all the exhibits to be 2-dimensional! What’s more, a few of my favourite local artists (Sarah Joan Mokhtar, Zid) are taking part so it’s all good. Though I’m currently not in Malaysia, I am thinking of making a trip home just for this. Hey, it’s not like we get that many gallery exhibitions dedicated to the comic artform in Malaysia, right? You can access the Sequential Narratives exhibition website here for the full list of participating artists as well as photos and videos of the exhibition. P/S: Galeri Chandan is on the ground floor of a double-storey bungalow unit, so do not be alarmed when you end up at a residential area!